There may be billions of stars in the sky; however “ANTARES” is the biggest visible star in the sky. The above statement really suits, in case of LinkedIn by making themselves unique among the social networking sites. Let’s look at how they become absolute in the present business world. Vision and mission of entrepreneur Reid Hoffman, in creating the world’s biggest business social networking giant LinkedIn. In 1993, when studying at Oxford, Reid Hoffman thought of starting a software company. So he approached venture capitalists for funding and explained his business idea. But he was rejected. In 1994, he got job at Apple and started working on eWorld project – Apple’s version of AOL. Later eWorld was acquired by AOL in 1996. So, he left Apple and joined Fujitsu for product management. In 1997, he left job at Fujitsu for starting his own business. He started a networking website called SocialNet, actually a dating site. But to his expectation, SocialNet failed to reach people because of its bad model and strategy. is this site down for everyone . So, he left SocialNet and joined PayPal board after meeting his friends Peter Thiel and Max Levchin. In 2002, after serving for almost 5 years they sold PayPal, an electronic payment service to eBay for $1.5 billion. In 2003, he launched LinkedIn by attracting investment from Sequoia capital. 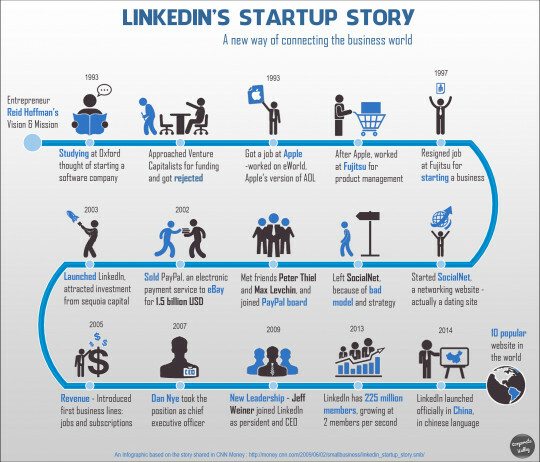 LinkedIn’s revenue model was introduced in 2005 containing jobs and subscriptions. In 2013, after 10 successful years with leadership changes, LinkedIn has 225 million members, growing at 2 memebrs per second. Today, LinkedIn ranks among the 10 popular websites in the world with over 347 million users worldwide! Employee by profession, Entrepreneur by passion.. Thanks for your comment. Kindly, have a look at our other posts in our website and give your valuable feedback!! Share it with your friends if your feel the posts are interesting..